PepsiCo, Inc. (NASDAQ: PEP) is set to announce its fourth quarter results on February 15, 2019, followed by a conference call with analysts. The market expects the company to report net revenue of $19.53 billion in Q4 2018, similar to the revenue level in Q4 2017. Adjusted earnings for the quarter are expected to be $1.49 per share compared to $1.31 per share in the year-ago period. The higher EPS is likely to be the result of cost savings due to refranchising of the beverage business in Thailand, cost reduction initiatives on a company-wide scale, and lower tax expense after the implementation of the Tax Cuts and Jobs Act. Full year adjusted earnings per share is expected to increase by 8.2% to $5.66, compared to $5.23 in 2017. We have summarized our key expectations in our interactive dashboard – Healthy Growth In Frito-Lay And Lower Tax To Drive PepsiCo’s Performance In 2018. In addition, all Trefis Consumer Staples Data is here. Higher sales of Frito-Lay: Frito-Lay North America (FLNA), which contributes a little over 25% of the company’s total revenues, is expected to post a revenue growth of 3.5% in 2018. The increase in revenue would likely be driven by effective net pricing, volume growth in variety packs, and its trademark Ruffles and Doritos, partially offset by declining volume of Santitas and Lay’s. The segment’s margins are expected to be higher in 2018 due to the net revenue growth and planned cost reductions across a number of expense categories. Though margins would increase, the growth in margin in 2018 would be slightly subdued – mainly driven by higher commodity costs, primarily potatoes and motor fuel, and a bonus extended to certain U.S. employees in connection with the TCJ Act – compared to a sharp margin growth observed in 2017. We expect the strong growth rates of FLNA to continue in the future, boosted by the segment’s foray into new products and healthy snacks. Weak performance of Quaker Foods: Quaker Foods North America (QFNA) would prove to be a drag on the company’s overall performance in 2018. 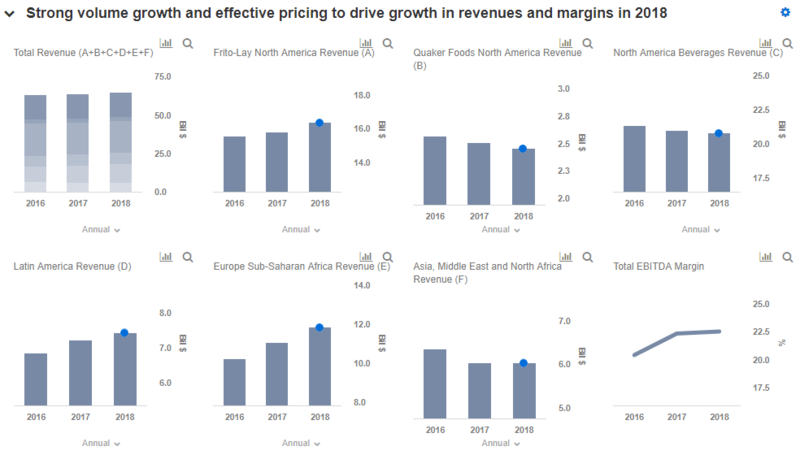 Net revenue from the segment is expected to decline by 2% over the previous year, primarily driven by a volume decline in the segment’s trademark snack food brand Gamesa and in the ready-to-eat cereals category, exacerbated by unfavorable net pricing mix. However, EBITDA margin for Quaker Foods is expected to be flat in 2018 on the back of lower advertising and marketing expenditure, coupled with insurance settlement recoveries related to the 2017 earthquake in Mexico. Growth in the segment is expected to remain flat in the near future. Impressive growth in Latin America, Europe and Sub-Saharan Africa: Latin America is expected to see very healthy growth of about 7%-8% in the segment’s organic revenues, driven by snacks volume growth in Mexico and Brazil, along with beverage volumes increasing in Colombia, Guatemala, and Honduras, partially offset by lower consumption in Argentina. Notwithstanding an unfavorable exchange rate, which is expected to offset the organic revenue growth by 4-5 percentage points, we expect net revenue from the segment to grow by close to 3% for the year. Europe and Sub-Saharan Africa is projected to witness the maximum growth among all segments of the company, with revenues growing at 7% with higher snacks and beverage sales in Russia, Turkey, Germany, and France. We expect the growth momentum to continue in both the regions on the back of rising consumption. Beverage refranchising: In Q2 2018, PepsiCo refranchised its beverage business in Thailand by selling a controlling interest in its Thailand bottling operations, which has kept revenues flat for the first nine months of 2018 compared to the previous year period in the Asia, Middle East and North African segment. For the full year 2018 as well, we expect revenues to remain flat at about $6 billion. The bottling business is a low-margin business which has a greater effect on revenues than on margins. Thus, the refranchising operation is expected to help the company cut down on its costs and lead to higher margins in 2018 and beyond in spite of no growth in revenues. Along with lower cost due to the refranchising initiatives, the implementation of the Tax Cuts and Jobs Act would help PepsiCo reduce its tax expense for the year, which would, in turn, translate into higher profit. The net income margin is expected to increase to 8% in 2018, compared to 7.6% in 2017. We believe PepsiCo’s recent focus on healthy snacks – with it shifting its portfolio to a wider range termed as “Everyday Nutrition Products” – would help it cater to the health-conscious young generation. The recent announcement of the $3.2 billion acquisition of SodaStream – the number one sparkling water brand – would likely help the company grow as there is a shift in consumers’ preference away from carbonated drinks and diet sodas, thus precipitating growth of the sparkling water category. 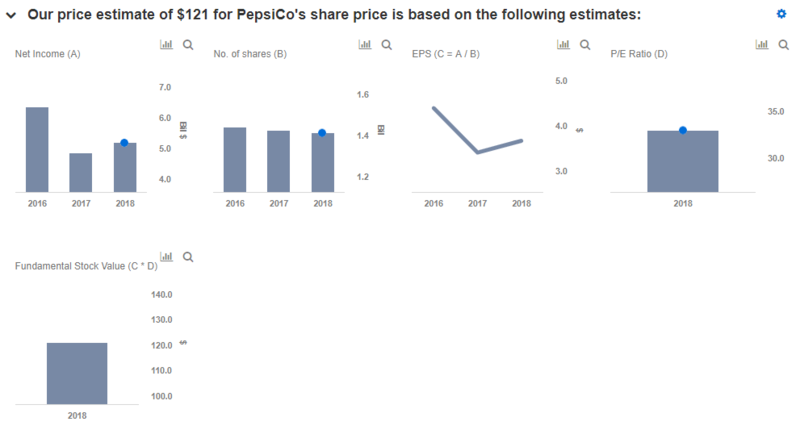 We have a price estimate of $121 for PepsiCo’s share, which is higher than its current market price. In February 2018, the company announced a new $15 billion share repurchase program to be completed over three years, along with a 15.2% increase in the annualized dividend. We believe that these steps to increase shareholder returns, coupled with organic revenue growth and rising margins, would support PepsiCo’s stock price in 2019.